LinkedIn is a huge network with more than half a billion professionals. As such, it presents a great opportunity for you to get your advertising message out to your target market using LinkedIn’s full-featured advertising platform with many easy-to-use options. Each of the advertising options allows you to reach your target customers in an affordable and flexible way. LinkedIn is perfect for advertising your business whether your goal is to generate leads (download our lead generation template for free), find business partners, attract talent or grow your following. 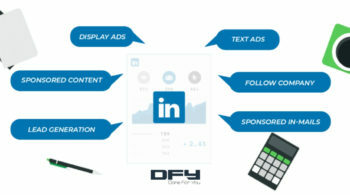 Let’s find out about the 9 different advertising ways available to you on LinkedIn. 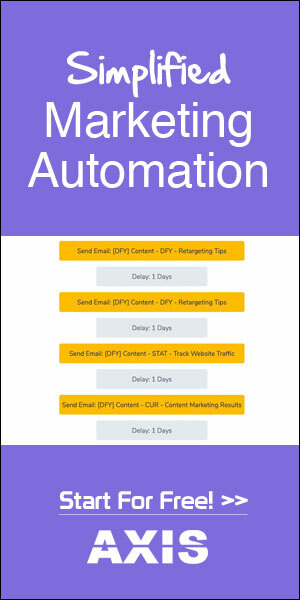 This self-service pay-per-click (PPC) advertising solution allows you to create and show ads on popular pages and page locations on the LinkedIn.com website. You specify which LinkedIn members (your target audience) view your ads by setting filters like: country, age, gender, job title, job function, industry, company name, company size, or membership in a LinkedIn Group. Your Self-Service LinkedIn campaigns will show as text ads. They will show at the top of the LinkedIn web pages, and, additionally, they will be featured in the right sidebar as full ads with an image. Sponsored InMail is a type of LinkedIn advertising that allows you to use LinkedIn InMail (direct messages to members) to deliver highly relevant personal messages to your target market. Sponsored InMail is much different from the regular InMail message, and also much different from other types of advertising on LinkedIn. The sole purpose of a sponsored InMail is to encourage the person to respond. You need to establish communication with the person first before you send them a marketing message. So, use InMail to entice people to respond. 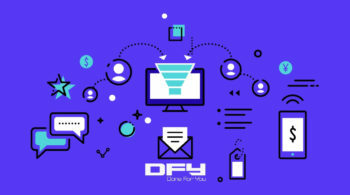 Sponsored InMail ads are always delivered (100% deliverablitity) to the top of the member’s inbox, increasing open rates, visibility and response rate. Sponsored InMail has an average open rate of 20% and a 20% click-through rate on the call to action (CTA). These open and click-through rates are well above the industry standard. You can use Sponsored InMail together with LinkedIn Lead Gen Forms. Read the article we wrote about lead generation with LinkedIn. There’s another way to advertise on LinkedIn, and that is Content ads. Content ads resemble a mini-website that lets you show multiple ads in one sidebar widget. They look like those rotating billboards you find on highways that display three different advertisements as the panels turn. With LinkedIn Content ads, you can display up to four advertising messages in different media formats, so you have more chances to catch the viewer’s attention. For example, you can display YouTube videos in one tab, your live Twitter feed in another, and custom ad copy in the last one. 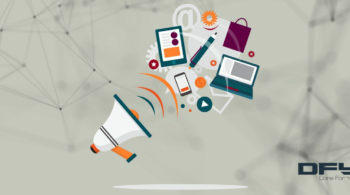 You can mix and match information to make highly engaging campaigns by offering or displaying digital downloads, podcasts, white papers, flash or image banners, or videos. Content ads on LinkedIn are a great way to reach many different customer personas with just one ad. LinkedIn Social Ads are an effective way to invite LinkedIn members to share information and recommend your products or services. Social Ads use the same type of targeting like other sorts of LinkedIn advertising but they allow you to leverage social proof throughout the LinkedIn network. The recommendations of trusted contacts are a highly reliable way to add impact and credibility to your brand message. LinkedIn’s considerable range of social ads is designed to leverage the way LinkedIn members use the network to share tips, information and ideas. Social Ads make it simple for members to endorse your company and spread the word about your products. This way of advertising on LinkedIn gives your content a better chance to go viral across the network. SlideShare is a LinkedIn service for PowerPoint presentations, documents, infographics and articles. It provides an excellent way to encourage member engagement. With SlideShare Content Ads, you can promote your SlideShare content in sponsored LinkedIn updates. This way, you can share your best content with an audience that is looking for expert insights. Normally, your SlideShare content is displayed within your LinkedIn profile, under the Summary section or in the Experience section. An effective way to advertise your business is LinkedIn Group ads. This type of ads is more personalized, targeted and relevant because it focuses on specific communities. The goal is to promote and drive membership to interest-based LinkedIn groups. LinkedIn Group ads come with viewer-specific social graph information within the ad to build a user-specific message, deliver Group recommendations, and build trust through a co-branded template that implies LinkedIn endorsement. LinkedIn’s Featured Company campaigns are quite similar to Follow Company ads (see below). The difference is the Featured Company ads are directly associated with your business page and lets you showcase links to the Jobs pages and Product Showcase on your LinkedIn Company page. This type of advertising is an organic-looking promotional tool that helps generate awareness and engagement for Company Pages. It encourages interaction directly from the way the ad is built. It also leverages the network connections of members to drive interest. The Follow Company ads only let the viewer click on the Follow Company link. 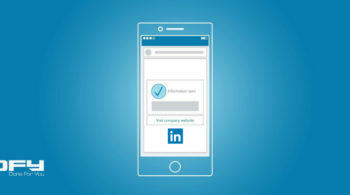 LinkedIn Follow Company Ads, as also mentioned above, are a unique set of display ads that take advantage of a member’s profile information to deliver a personalized message and generate interest in your Company Page. These campaigns enable brands to target professionals, create awareness for their Company Page, and convert people into active followers. Last but not least, a Spotlight Ad (part of the Dynamic Ads feature) is a fully customizable type of ad that leverages the LinkedIn profile image but can link to the advertiser’s landing page. These ads resemble normal content on the page and don’t use the typical ad formats. Because Spotlight Ads blend in with the network’s content, LinkedIn members often click on them not realizing they are looking at ads. Spotlight ads let advertisers showcase events, products, services and more. 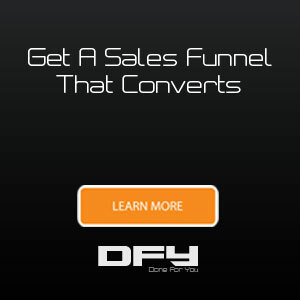 When members click on your ad, they will instantly be redirected to your landing page or website. Spotlight Ads were created with the aim to help a job seeker land a job by associating their profile image with a business logo. This is how these ads work: they show a member’s profile picture in the ad under the ad headline, “Picture Yourself at Company” and their new job title under their name. This helps people visualize themselves at your company. If you are looking to have a team of experts create effective advertising campaigns for your business, don’t hesitate to contact us. We have a professional PPC team that will review your requirements and create campaigns that drive results. If you want to explore LinkedIn advertising, visit this link or sign in to your profile to start a new campaign. For each campaign, you can create variations to test different ad copy, images and landing pages. It is important to carefully define your target audience. You don’t want your ad to be shown to anyone; you should define an audience who is interested in and needs your product, and who is more likely to convert into a lead or customer once they click through your ad.